The lover of mind has landed in Warsaw. This city is extraordinarily beautiful, green and without blemish. From the old town which was rebuilt after having been destroyed during the second world war, to the grandiose 43 storey stamp of the Pałac Kultury i Nauki, one can’t help but be impressed by it all. I’m staying in a very lovely hotel just south of the city centre next to a grand park and all of the various embassies. 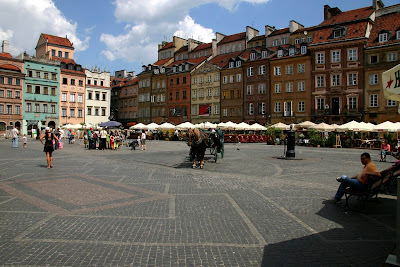 From there i was advised (by folk in the know) to go to the old town (Stare Miasto) to have a look at all of the lovely old (new) Polish buildings. During the second world war, Warsaw was essentially gutted. Most of the historic buildings were completely destroyed and the old town centre was rebuilt from scratch. Wandering around European cities, one becomes accustomed to the sight of buildings which if not exactly crumbling, show all of their three hundred or so years. Here everything comes across a little bit Disney. The entire old town is so incredibly pristine that rather than being 300 years old, most buildings look as if they have travelled through time. I wouldn’t be surprised if the whole Stare Miasto was injection moulded in one piece from fadeproof plastic in a Detroit factory and shipped over as part of some covert Marshall plan. It’s a great shame that so much of this great city was destroyed in the carnage of 1939-45. 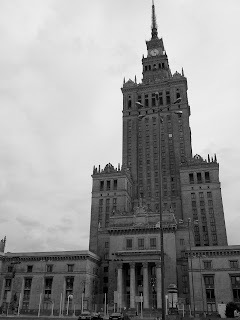 Still imposing upon the skyline is Stalin’s great stamp of authority, the Pałac Kultury i Nauki-a full blown propaganda factory mass producing and distributing Soviet pronouncements in the form of films, books, plays and exhibitions. 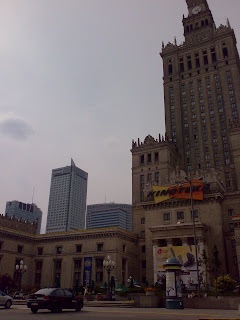 Now though, the huge tower is somewhat eclipsed by the skyscraping testaments to Poland’s new legacy. Viewed from one side, the Stalinist face of hard nosed totalitarianism is still there to be seen. Viewed from the others, the huge Carlsberg parasols, the brightly coloured advertisments and the various other skyscrapers peer over Stalin’s long-dead message. Perhaps even more ironically, underneath one face is a massive skate park full of teenagers humming Green Day and periodically rescuing their trousers from the ever present clutches of gravity. If you look carefully at the right hand photo, you might just be able to see on the left the massive cuboid of the Intercontinental along with various other skyscrapers belonging to foreign banks. The man of steel would turn is his grave.